Backward steps won’t save your soles. Zero Christians? I expect there are a few more true Christians than that. The millions who only pretend to be Christians don’t count. Tell the cook her grub is imperfect, and watch the butter fly! Onward Christian Soldier is now taking a backward step. Pride Tonic is infamous for its runaway rainbow color. A pride tonic is good for those who are lion about their lives. A worm’s final form is bird splatter. Is that final form in the bottom of a bottle of tequila? 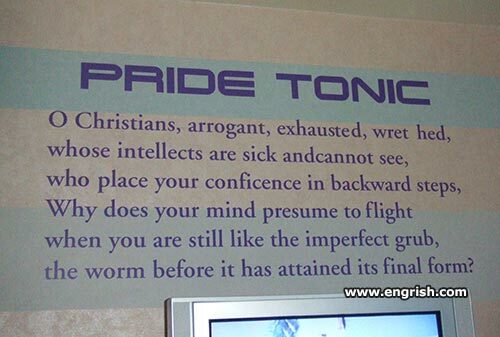 Pride Tonic is the missing link between karaoke and Dante Alighieri. This tonic is a cure for what hails you. I Dante think they understand the quote. Although being stuck in a Tokyo Karaoke Bar probably would count as a form of purgatory. That’s not much of a recommendation to be christian. BTW I finally had time to translate the “Sense Up” wipes post from a few days back. Busy time. Apologies for the delay. Thanks for the translation hombre. Muchos gratias. If I am to be reincarnated, I would rather it be as a Dolphin, rather than a worm. If that’s all right with you Boss. Not that I have anything against worms. Hey! It’s not “Baking Paper” is it? The stuff you line cake tins with. My wret hed head sees a missing c.